Perfect for Christmas eve, take a look at this previously posted pasta dish. Christmas eve, my family makes a lot of fish. La festa delle sette pesce, the feast of 7 fish is a tradition in many Italian homes on Christmas eve. We make 7 seafood dishes on Christmas eve. This pasta dish is certainly one of them. It's definitely a favorite for my family and guests. Fresh is best, but if you don't have access to a fish market, frozen will do. Seafood Medley is a mix of Shrimps, Calamari and Scallops. I lightly sauteed them in Tomatoes, Garlic and White Wine. The results were incredible! I served it over spaghetti, but you can serve it without if you are watching your carbs. Either way, it is sure to be a pleasing meal. This meal took no time. The entire meal, with spaghetti was prepped and cooked in 10 minutes flat! I used frozen shell fish, so my prep was mostly done for me : ) While the pasta cooked, i make the seafood. I made this meal together with an old friend of mine, Luisa GangiDino. I met Luisa in the 3rd grade when she and her family came to America to live from Europe. My elementary school principal knew I spoke Italian, so they put Luisa and I together so that I could translate everything the teachers said. Imagine translating everything! Our first day together, I can remember going into gym class with her and explaining the rules of dodgeball. We were together all the time. Here we are 30 plus years (I'm being vague and generous here) later and still friends. 16 ozs of shrimp, calamari and scallops blend, Trader Joes has this mix in the frozen section, or simply buy 1/3 pound of each fresh, wash and cut the calamari into rings and remove shell from shrimp. Parsley, 1/4 cup chopped fresh or 1 teaspoon dry flakes, I much prefer the fresh in this dish. In a medium skillet, sauté garlic in oil on medium flame until golden. Add tomato, sugar, parsley and wine, sauté an additional minute. Add in washed and drained seafood, cover and cook for 5 minutes. Serve as is or over your favorite pasta. Lovely! I've tried this and it's really awesome! I sure hope you will continue to post recipes! My fave is the 3 protein rice, but also make several others...! I agree with Sissy. My family has loved everything that I have tried from your site! This seafood medley in a tomato broth sounds wonderful.. Thanks for the recipe. 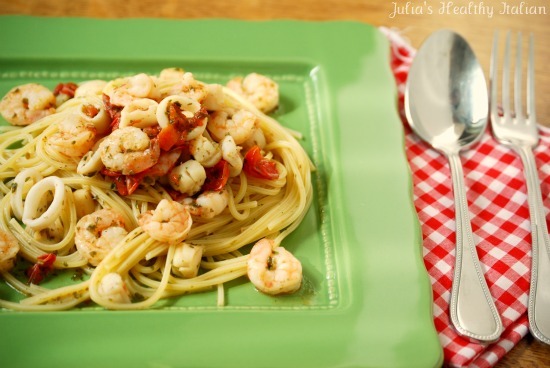 This seafood medley could make a great meal for any occasion. Thank you for posting. Whew, your website was gone for a few days. I was worried...I hadn't printed out all of the recipes that I love from your site. Glad it was temporary and I hope that you will share more of your recipes in the future. Thanks for your great recipes!! It's good to be back Libby!